Camouflage Learning - Remove the barrier of "Learning being boring!" I have found I use iPads in two major ways within the classroom: as a tool to engage and as a tool to create. In most of the projects I have completed with the children this year, I have tried to combine both these elements to get the best work from the children. 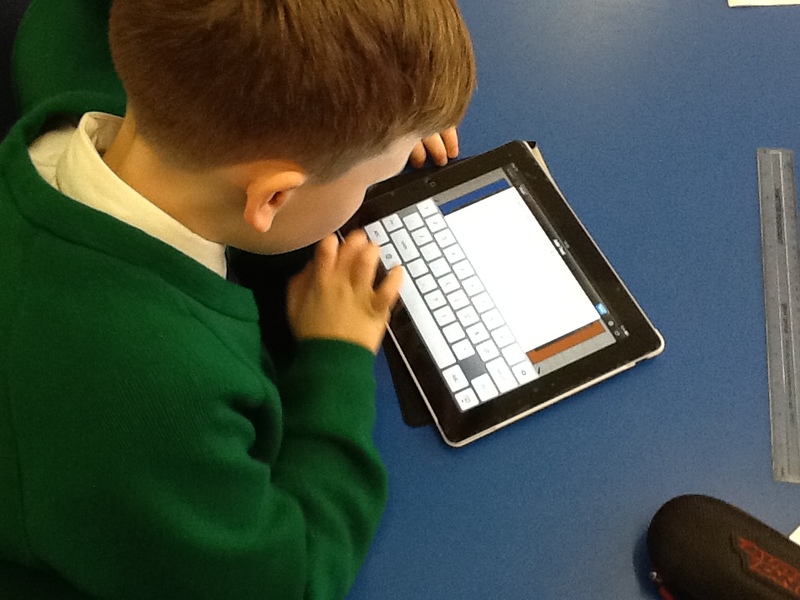 Firstly, using the iPad to provide a focus to use in lessons has had a massive impact as far as engaging children, motivating them and leading them into a "false sense of learning." I recently attended and presented at a Speed Learning event as St Silas Primary in Liverpool. I provided a staff inset at the school where I shared different ideas of how I use the iPad to get the children engaged and then to create. I am always pleased to see some of those ideas being used. You can see the great work the school is producing on their school blog - http://stsilasblog.net/. It was during the keynote presentation from @digitalroadtrip at the start of the Speed Learning event that the phrase "Camouflage Learning," was introduced. The idea that children are learning by doing activities where they feel they are "playing" is something I am always trying to promote. It is the perfect way to get disengaged/reluctant learners on board and almost trick them into writing/reading/solving problems. Nothing sums this phrase up more than the work produced by children when the focus has been the iPad games they are obsessed with - Angry Birds and Temple Run. You can read the post here. If you were to ask children what they had done in many of the lessons, some would say they had just played their favourite games, which to some extent is true. I usually had five minutes planned for children to play the game at the start or end of the lesson. However what some may miss telling you is that during the topic they learnt and created vocabulary word walls, character and setting descriptions, comics, stories, instructions, non chronological reports, game play recounts... the list is endless. Using these games as the stimulus and focus in class promotes that mantle of the expert philosophy too. Children are experts in these games, they know how to play, the different parts to the games and teachers can play the 'dummy' role adding more responsibility on the children to produce work which is written correctly, including all the right features. As the children know so much about the games it also means teachers can really focus on the features of a specific text. In the past I have taught non chronological reports about volcanoes, children then have to learn all the information about volcanoes on top of learning the features of the text. For some, it can be too much and focusing on all the information can mean features fall by the wayside. To only use the iPad in this way however will never justify the huge expense of purchasing a class set. It will only have a limited impact on the children's learning as the real potential in these devices lies in the ability for children to find new ways to create and show their knowledge and understanding. As mentioned at the start by combining the engaging with the creating aspects can lead to some of the best work children will produce. I have seen first hand how these devices can support children with SEN and also stretch higher achievers to think more critically and creatively in order to complete tasks. Apps such as Explain Everything and Book Creator are redefining the way in which different tasks can be completed to incorporate different skills and promote creativity in a 21st Century Classroom. For me though, it all comes down to the teacher! An iPad will not improve you as a teacher, it will not turn you from a satisfactory teacher to an outstanding one. Teachers need to use the iPad in a way that will best fit into the dynamics of the class. Would I use Angry Birds to teach every literacy text genre? Of course not, however, if I know my class will respond well to using that as a focus, I will use it to get the children writing a set of instructions for example. If I feel the children will best demonstrate the objectives of the lesson by creating animations, videos, comics on the iPad then children will use the iPad to prove their understanding of that objective. I would like to state that in all my teaching using the iPad, I have never taught an iPad lesson, I teach lessons using the iPad as a vehicle to enhance learning in that particular subject. Camouflage learning is an approach I have seen work in my teaching. The iPad can be a great tool to use to promote this strategy but I must emphasise it is by no way the only way to use these devices. If you feel camouflage learning is something that your school would benefit from and would like an inset/training on how the iPad can be used in this way, please visit here to learn about training I can provide. Great post Mr P! I feel very honoured to be name checked. Your blog is fabulous resource for all teachers! I have pointed quite a few people this way and will continue to do so!